Next: Next post: What Does Tiger Woods & Top Producers Have in Common? Do you remember choosing up teams to play baseball insert your sport) as a kid? Two captains would be “appointed” or “anointed” depending on the social structure of the playground. They were normally the two best players and their leadership role had nothing to do with their ability to lead the team or even pick good players (this is true in many of our adult playgrounds called “the office”). The remaining athletes would be lined up opposite the captains, staring intently at them trying to be the next person selected. The ultimate humiliation was being in the final two, knowing only one would be the infamous last pick. Sounds a little like American Idol, huh? 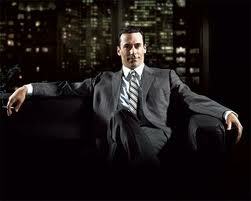 I’ve been watching AMC’s hit television show, Mad Men on Netflix. I just finished Year 3 (two years old so consider this your spoiler alert) where Don Draper leads a group of people from the firm, including two partners, to form their own agency. They take drastic and covert action when they find out that their old agency was being sold and they didn’t want to play along. At the end of the episode (and season), you see Draper standing in the hotel room being used as the new office. He is gazing at the 7-8 people he hand picked to “play ball” with the new agency. These were the ones he wanted to move forward with. He had a choice to pick the best of a larger field and he chose them. Four years ago, as I was preparing to take the presidency of my 130-member Rotary Club, one of the guest speakers in my workshop asked a compelling question — “If your club had to whittle itself down to only 25 members, would you be one of them?’ Thought-provoking. If you had to choose 5 people to move forward with a new organization, whom would you choose? Why? Would you even be one of them? Not everyone in your organization work and perform at the same level of excellence. Are you spending too much time trying to “fix” them at the expense of enhancing your best performers? Unfortunately, many executives and business owners spend too much time with the squeaky wheel. The same thing happens in our schools and non-profit organizations. In the end, it only hurts them. The best path is to work on your strengths, not your weaknesses. Does this person have the skill set for the task or job at hand, or are they merely being promoted due to longevity? Does this person have a high ceiling to success or do they have a giant bump on their head from smacking their ceiling? How well do they play with others? Are they “coachable?” In other words, are they willing to constantly improve their skills, or do they think they have mastered it all? Too many executives and business owners waste time and money on trying to fix the unfixable. You’re better served enhancing your strengths by empowering your strongest performers. Less labor intensity and more return on investment. Find ways to build on your strengths, rather than fix your weaknesses. It’s about success, not perfection. Final thought — Look at yourself in the mirror. Should you be on the team? Are you providing leadership with passion, skill, and inspiration? Would your employees or your “team” trade you at the trading deadline? Are you enhancing or detracting your organization’s performance? Honest evaluation needs to be done on the entire team, including you. Bottom line — Who would you go to war with if you only had four other people to choose? What characteristics make them your choice? What role do you play in best igniting their talent? Take those answers and instill those values in your strongest performers and watch your organization prosper.